Putting the 'Do' in Domesticity. Just wrapped up these handlettered, dip-dyed, letterpressed nautical wedding invitations for a client-turned-friend (love it when that happens!) Can you say swoon? We had a great time coming up with this concept. Her groom is a captain on the high seas and although he’ll be wearing his dress whites, the event is full of whimsy. I can’t wait to show you how it all turns out. But for now, let’s talk invites. The design is hand drawn and then edited in the computer, I got photopolymer plates made and had the design letterpressed into stupid thick 236# cotton savoy paper. Navy blue ink to match the envelopes, which I handlettered the addresses using a white gel pen. Let’s talk dip-dying. I used scraps of my paper to test the color. I used liquid Rit dye and followed the directions on the package. Most importantly, use hot water and stir frequently. But these were so stinkin easy. Just dip the paper in for a couple seconds, lay flat on a baking sheet lined with paper towels and blot dry with dry towel. Don’t let the paper absorb too much water or the paper will warp. That would be bad. 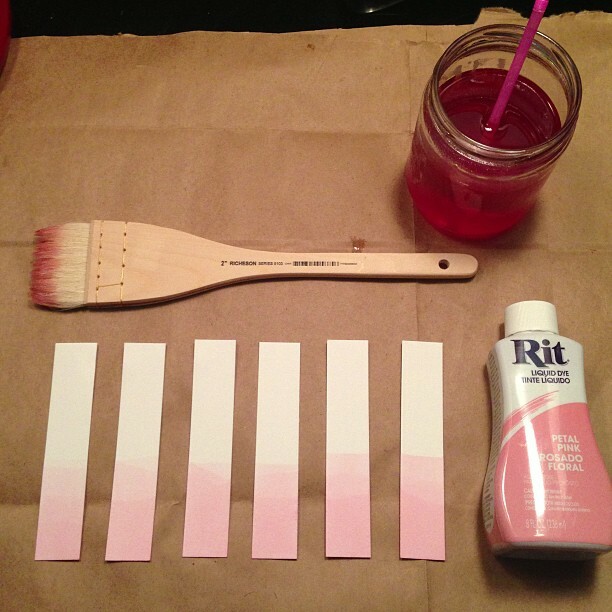 Let them air out on a drying rack and repeat the process from different angles and depths for an ombre effect. Seriously. This part was so much fun. But be careful not to fling dye all over the place in your excitement (like I did). The wedding is this weekend and I’ve done a bunch of other projects for it, can’t wait to share with you! Posted in Crafting, Entertaining, Graphic Design and tagged crafting, dipdye, diy, handletter, handlettered, handlettering, handmade, howto, letterpress, nautical, paper, papercrafting, typography, wedding, weddinginvitation. Bookmark the permalink. Designer, Maker and Doer. Native Oklahoman, making a home in New Orleans. HAHA! I know, right? Been keeping myself busy and maybe, just a little bit, overthinking things. But I appreciate the accountability! I’m gonna be better about this. I promise. Love the lettering! Savoy is some of my fave stock, so rich! 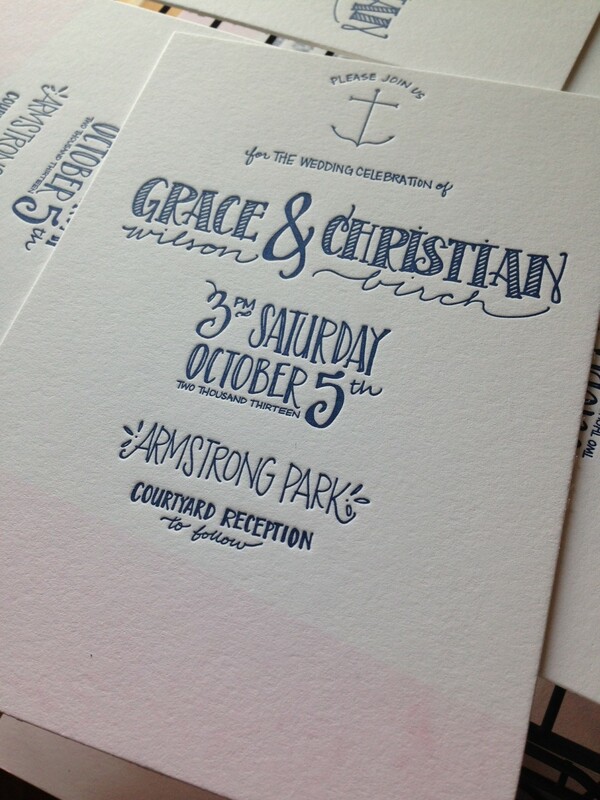 Did you do the letterpress printing as well?? Hi Norielle! 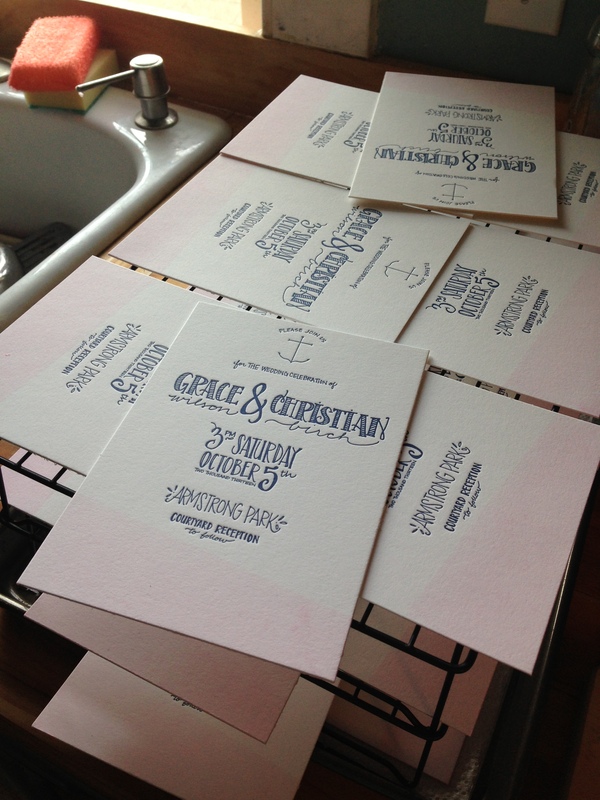 I team up with a local letterpress company who does the printing for me. Oh. I. Wish. For at home letterpress printing, I recommend using the L-Letterpress by Lifestyle Crafts and ordering custom plates form Boxcar. The depth of the indentations isn’t quite the same, but it’s not bad. Otherwise, keep your eyes peeled for old-school tabletop letterpress machines. My friends at Grove Street Press have one and it’s pretty awesome! I’m sure there’s a few out there sitting in antique or thrift shops just waiting to be loved!